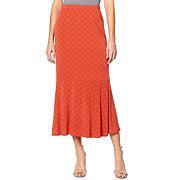 Check you out in this photoshoot-worthy pencil skirt. The lightweight, fine-gauge knit with houndstooth trim and a figure-flattering silhouette is the ultimate in city-chic, lady-boss styling. Purchased black in size medium. I am 5'9" and weigh 1 78. 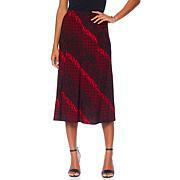 The skirt is classy and appropriate for any occasion. It hit below the knee. I wish I had ordered the jacket and top as it would have been a beautiful suit. Love love love this I all so get the the jacket and top. The hold outfit looks good on me.I got so many complaints I got it in gold. 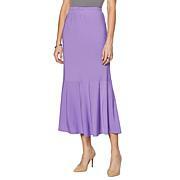 I order two of these skirts on a whim - one purple and the other gold. The reduced in price, and I thought "what do I have to lose. I love them, and get flattering comments every time I wear them. Would love to see more in the fall and winter season in other colors. They read like much more expensive knitwear. BRAVO!! 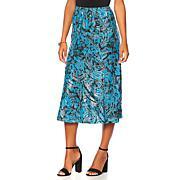 This skirt is a very classy pencil style. The fabric is extremely nice. I got the black. I don't have the contrasting pieces, I plan to wear it with a white tie-bow blouse and white shoes. The ladies will be 'Checking Me Out'. I'm a big Antthony fan, I adore his fashions.